This blog post and video guide describes how to force the Lync 2013 client to always show the end users Lync picture even after the user might have changed the setting not to show the picture. 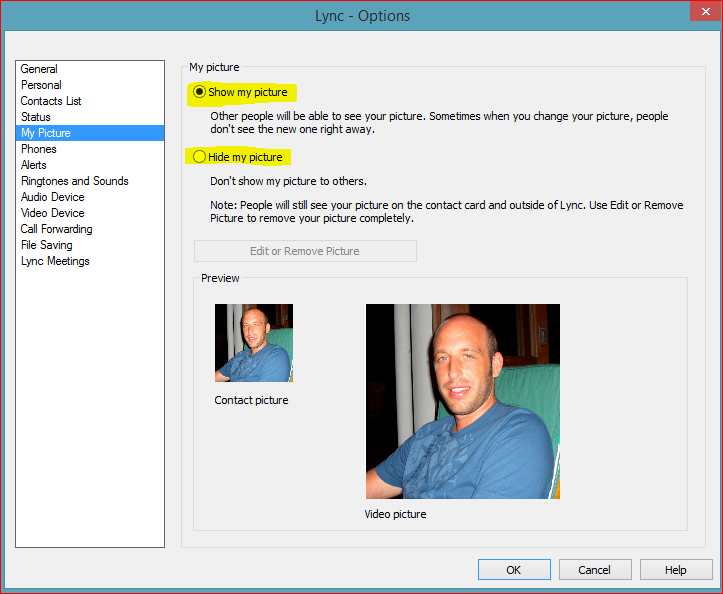 To but a little bit of background around this, as with Lync 2010, Lync 2013 does not have the ability to block or stop a user from deselecting the option of showing their Lync picture. This picture element is something I’m asked many times while working with customers. I know this is something which we all would like as a option but as of today and as far as I’m aware this isn’t something close to Microsoft’s heart in fixing or providing a solution. Also to confirm there isn’t any policies you can assign OR and registry setting to can associate to block the user changing their setting. So what solution and where is this setting stored….. Well its not in the xds database and actually its started within the front ends rtclocal database. Under the covers what this binary code states is DisplayADPhoto true/false. So as part of the update we change for the status and update accordingly when the status is false. 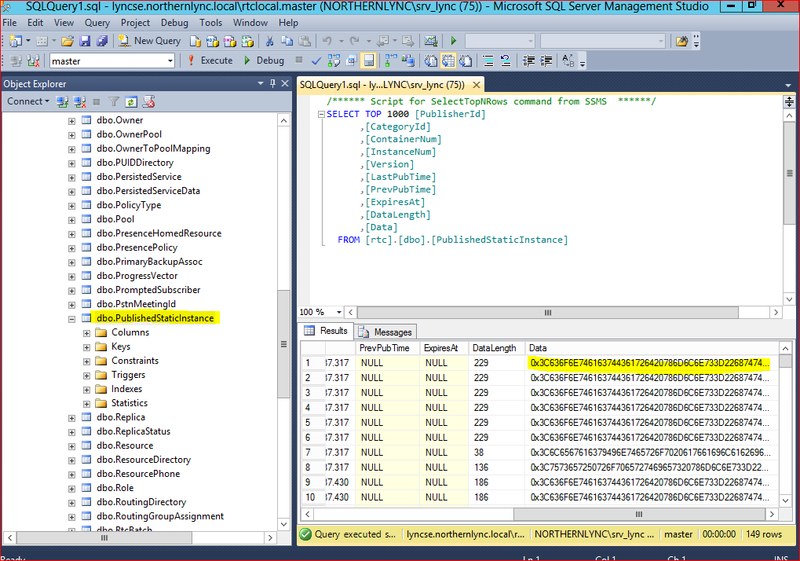 As this is running on rtclocal, the way the guide runs this is via a scheduled task running a .ps1 powershell command. Also the SQL only checks the last 15 minutes of changes to reduce locks and database processing. Also the scheduled task I’ve created runs every 15 minutes so with the two you will never be out of sync with what a user is doing. (you could run this script more regular than every 15 minutes but given the requirement i think 15 is a good medium to use). As for the SQL command some thanks go out to the tech net community as understanding the converts within the SQL was a slight challenge. Remember the script is changing the rtclocal database on the fronted and this will be seen as not supported by microsoft.! Over the weekend Microsoft realised a new patch for the Microsoft Lync 2013 client for windows. Although this isn’t seen as a major update there are several features within the patch which are of interest. In this blog post we will take a look at what they are, and how to enable/add the features. and you can also download the update files from that link. The update as usual comes in two flavours 32 bit and 64 bit. To note there are a a few pre-reqesuitcs that need to be taken care of before you start. These are other updates which requires to be present on the machine your updating. 32 bit Download the 32-bit MSO update package now. 64 bit Download the 64-bit MSO update package now. 32 bit Download the 32-bit MSORES update package now. 64 bit Download the 64-bit MSORES update package now. 32 bit Download the 32-bit IDCRL update package now. 64 bit Download the 64-bit IDCRL update package now. Lets take a look at a few of these in more detail. – “Presence unknown” status for a contact in a federated environment or a different front-end pool is displayed in Lync 2013″ This issue was introduced with the October 2013 update patching. What was seen by the end user was no presence connectivity between Lync and Exchange meaning that when a user had a meeting scheduled within outlook their presence didn’t mirror this within Lync. I personally have a client who also runs a contact centre where they rely on the Lync presence being correct at all times. From the users Lync client options they now have the ability to select to record the video stream in full 720p or 1080p HD quality if they wish. Yesterday Microsoft released a new Lync client update as part of the windows update. (its also available via a download here. http://support.microsoft.com/kb/2817621 there doesn’t seem to be much of information about the update apart from in also has the other patches within it..
– After you wake up the computer from hibernation mode, Lync 2013 becomes very slow and unusable. Ive been running the update for a day now with no issues.